I am thoroughly convinced that, as an actor, Michael Fassbender can do anything. No kidding: In just the last two years alone, he's given credible and creditable performances as a Wild West gunslinger (Slow West), a Shakespearean icon (Macbeth), a comic-book villain (two X-Men movies) and Steve Freakin' Jobs (Jobs). And mind you, that's only counting the most recent additions to a resume that already included his exemplary work in 12 Years a Slave, The Counselor, Shame -- and, yeah, yet another comic book movie, X-Men: First Class. 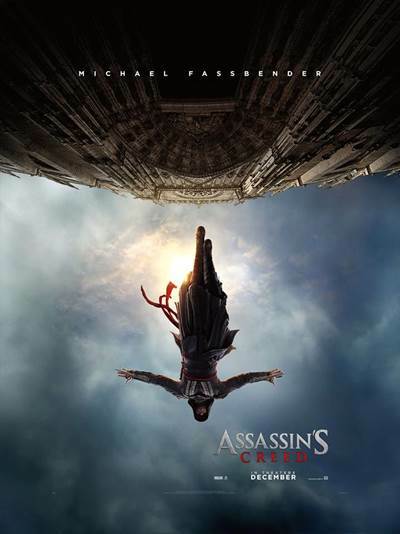 So when I got my first look at this trailer for the upcoming Assassin's Creed, which opens in theaters and drive-ins everywhere Dec. 21, I thought: Well, I'm not the world's biggest fan of movies based on video games. But with Fassbender in the lead role -- along with Marion Cotillard, Brendan Gleeson and the great Jeremy Irons in supporting roles -- OK, I'll go there. Besides, it's hard to resist any movie that contains the line, "Welcome to the Spanish Inquisition." Which, as any Monty Python fan can tell you, no one ever expects. Wow, that's an incredible cast!